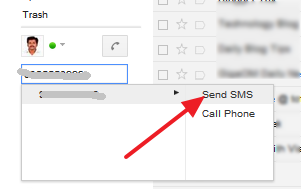 Gmail introduced new feature that users can send free SMS from Gmail. In India Gmail accepts all mobile operators so user can send free SMS for all mobiles. Users can send 50 free SMS per day. That's all your message will go to your friend mobile via SMS, If you friends replied to your message it will show on this chat window. Your conversions will be saved in your chat history just like regular. Scroll down until you see Text Messaging (SMS) in Chat, select Enable and Save Changes. 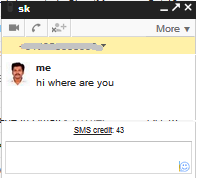 You may also enable a supplementary lab called SMS in Chat gadget."